Being kind to yourself really matters. Our children need us to cope with the big feelings in us and in them. Parents love their children and generally wish to be calm and patient, and can then feel powerless when strong feelings arise in reaction to what their child does or doesn't do. But bringing some positive attention to resolving those feelings is something that's within the parent's power. Learning to respond with more empathy and care to our own messy feelings is a fundamental element of peaceful parenting. It's hard to give to our child that which we're not receiving ourselves. Do you notice that when you feel more positive and at peace with your own feelings, that this greatly improves your connection with your children? And increases your tolerance and even commitment to listening to your child's complaints and upsets? “Good relationships depend on finding a reasonable balance between being able to track your own feelings at the same time as you track other people’s.” Sue Gerhart , author of “Why Love Matters”. You can absolutely trust that the internal changes you choose to make in healing the unresolved hurts of the child that you were (re-parenting yourself) will ultimately result in a lessening of the stress and pressure between you and your child. As a parent increases their ability and skills to better manage and care for their stress levels and the sore feelings that get inevitably triggered in the family, this ultimately results in more harmony, attunement, enjoyment and mutual trust in the parent child relationship. It can be very empowering for parents when they start to realize that the most stressful feelings that arise in difficult situations with their child actually stem from their own childhood. Our children need and deserve for us to do the big work of coming to peace with ourselves. Coming to peace with ourselves includes forgiving ourselves, and that, for most people is easier said than done! Especially when things aren't going as smoothly as we'd like, especially when there are tensions in the air with some of our close people including our child and/or partner. Sometimes it’s easier to feel down on ourselves than kind towards ourselves. Yet it’s our responsibility as parents to prioritize the actions and habits of self-care that help us to maintain a soft heart. Maintaining a soft heart requires us to come back to peace with ourselves again and again. The more we come back to peace with ourselves despite feelings of guilt, shame or self-doubt, the more we can develop a kind and soft heart capable of empathy and compassion towards others. Maintaining (or beginning to develop) a soft kind hearted feeling towards ourselves forms the foundation for peaceful respectful relationships with others. practice active listening, empathy, using "I" statements to express what you feel and what you need, express boundaries with consideration of the other's feelings or inviting a process of problem solving with the aim of coming to an agreement. It's not easy, but much more constructive when you can open your heart and seek to connect rather than defend, seek to understand as well as seeking to be understood. We're more likely to eventually feel heard, understood and ackowledged when we practice showing others that we hear, understand and acknowledge their feelings and perspective, even when we don't agree with them. Acknowledging words like "I can real hear how hard you're finding this" can create some common ground and dissipate some tensions. Having a positive compassionate relationship with ourselves is the key to developing positive compassionate relationships with others! When we speak from a warm compassionate and kind place in our hearts, our child(or partner) can see, feel and hear our care and compassion for them. Yet to speak from a soft kind heart, we need to develop a soft kind heart towards ourselves. As much as ignorance can be bliss, the truth can be painful. And in a way, the more a parent values relating with empathy, the more a parent becomes aware of the negative consequences of relating with hardened hearts and harsh words. When a parent tunes in to notice the quality of empathy, understanding and listening they give their child, the more they often notice where their relating lacks empathy and true listening. And this can be incredibly painful for us parents. It hurts to see where we hurt our child. It can hurt so much that we shut that feeling off and refuse to see and feel it. 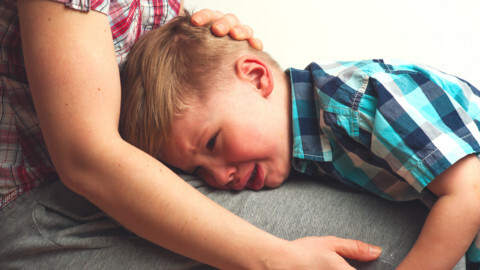 When we speak unkindly towards our child, when we speak harshly from our anger and defensiveness (as we all do at times, especially when we become triggered), it’s easier to view that our child caused the friction between us, "why wouldn't you listen", "I wouldn't have got angry if you'd done what you were told to do". It’s easier to blame them than to own up to having let our stress, fears or anger spill over on to them and admit even to ourselves that they didn’t deserve to be spoken to harshly and that our words or tone of voice hurt them. And it’s also easier to blame ourselves for making mistakes than to forgive ourselves. Guilt, shame, self-blame and even self-hatred can be easy feelings to get drawn down into. They are carried in the body with a tangible weight, they feel heavy and can pull us down like gravity. Deciding to soften our hearts, to come back to peace towards our self and our child can feel like swimming against the tide. It takes self-discipline, and it takes clarity to even know that softening is the best thing to do, or even an option at all. It takes a lot of commitment to peace, to being at peace with ourselves first and foremost, to resist being pulled down by the urge to blame ourselves or blame our child. It’s easy to feel like we don’t deserve to forgive ourselves when we see that we’ve hurt our child or failed to meet their needs. It’s easy to feel that mistakes deserve punishment because you’ve most likely grown up in a society that reinforces the belief that we learn through enforcing painful consequences. Yet enforcing painful consequences for mistakes creates more pain, more rebellion, more resentment, more hatred. Being honest with ourselves about the natural and even painful consequences of our actions or lack of action and then applying a commitment to learn and grow within a feeling of self-love, self-care, self-healing and self-compassion leads to greater wisdom and the healing of the inner conflict that caused us to act out of balance in the first place. We all deserve to live in peace, at peace in our minds and at peace in our hearts. We all deserve to live with a clear conscience. Choosing to come to peace takes us from a path of pain to a path of more love, from destruction to construction, from violence to peace. We all deserve to forgive ourselves and see that compassion for the painful feelings allows us to meet the unmet needs. Just as our children need and deserve our compassion the most when their behaviour is the most out of balance, we need and deserve the same thing. Do what you need to do to keep bringing the focus back to self-love, self-soothing and self-regulating. Taking time for a relaxing cup of tea. Put your hand on your heart and say some encouraging words to yourself (even if you feel silly - try it!). Getting out in nature. Making time to share with a friend. Listening to the music that feeds your soul. Whatever helps you feel enriched, satisfied and connected. Can you maintain and model healthy boundaries?